We have to love social media…or, do we? I couldn’t help but notice the many postings on Facebook–both video clips and status updates referring to Rachel Jeantel, Trayvon Martin’s friend, who was the last person to speak to Trayvon, and the key witness in the George Zimmerman trial last week. Now, that I am so with it, and on Twitter, the first tweet I saw about Rachel Jeantel’s testimony, which was tweeted (see how I have the lingo down?) 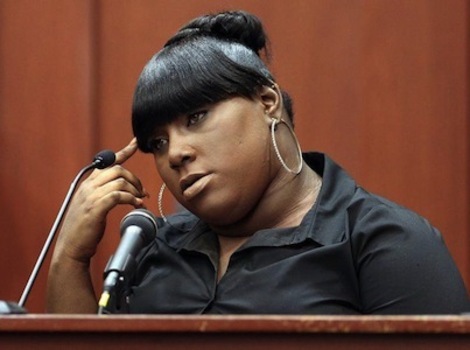 by a black man, said that Rachel Jeantel was an embarrassment, probably the worst witness ever. Then, more tweets and status updates and blog posts on fb followed: “She makes the black community look bad.” “She’s ghetto.” “She slurs her words, rolls her eyes…” Olympic athlete, Lolo Jones, tweeted that she was going to make a Madea dvd out of Jeantel’s testimony and sell it. Many laughed along with her, but thankfully, many also chided Lolo on Twitter and in blog posts, for her insensitivity toward Ms. Jeantel. To get a better perspective on the talk about the negative stereotyping of black women surfacing because of Rachel’s testimony, I settled into Melissa Harris Perry’s MSNBC show where she and featured speakers dissected what was happening with social media and stereotyping during the Zimmerman trial. The biggest point driven home to me was Melissa and her guests’ statements that our comments and writings on social media expose how judgmental we are when it comes to race and class. Our comments say more about us as a people, black and white, than it does about Rachel Jeantel. We’ve picked on her diction and grammar. We’ve picked on her appearance. We look at her, her dark skin, her curvy shape, her hoop earrings, and her mannerisms, and expect her to behave a certain way. We expect her to not be smart. Guests on the MSNBC show went on to say that the middle-class black community wants to turn its back on the “Rachels”, and not be associated with members of the poor, black community who they feel “reflect badly” on black people who lead more self-described respectful, successful lives. Worse than that, Harris Perry says that because of all these things, we expect Rachel to not be surprised that her black friend ends up dead–that these are the things that happen to people that inhabits these kinds of bodies, these kinds of lives. I posted some time ago here about the black girl stereotypes that played out in my head, and my peers’ heads, during my high school years in One Of A Kind Black Girls. We all have them. Stereotypes. We have stereotypes based on race ingrained in our brains from the way we’ve been raised, what we’ve read, seen on television, in movies, on the news. We’ve seen things the way they’ve been constructed for us to see them. We are subtly, and not so subtly “taught” that someone who lives in poverty, dresses a certain way, speaks a certain way, looks a certain way, has a dark skin color, is somehow less than us. Now, we add social media to the mix, and we have become master judges of character and intellect. It’s not pretty. All of the guests on the Melissa Harris Perry show asked us to think about Rachel Jeantel as a teenage girl who lost her best friend to murder, who had to sit across from the man accused of killing her friend, and Trayvon’s parents, and know she was the last person to speak to him alive. I know I will strive to always take this point-of-view before I judge, and jump on the “let’s make fun of so-and-so” band wagon for millions to see. What have you been hearing? What are your thoughts? Although this isn’t the primary basis for your blog, it is interesting to consider what impact various forms of social media have in general on all of society along with the ability to perpetuate stereotypes. A few that come to mind quickly – the assumption that if it is written it must be true, or the intense speed that the tweets etc. are spread, the depth of people they reach, the anonymity that they allow, and that the social media thoughts are forever recorded and preserved on a server somewhere. Couple that with the poor judgments that you describe and there is a recipe for an everlasting and continuing presence of misinformation that is offered. Thanks for your thoughts about the impact of social media on all of us. It definitely relates to what happened with Rachel Jeantel, and anyone that is in front of the public eye. We should all take heed to what you say, noting that what we read is not necessarily true, especially when it comes to people’s opinions and judgments on a person’s character. The thing that has been bothering me most, is the quickness with which people take to posting negative comments, and the vastness of the social media landscape–the sheer numbers of people that then get to see the ugliness that we put forth. And, then, ultimately, it’s about how that person all of this negativity is being directed toward must feel. Thanks again for reading, and sharing your thoughts. Hi, there, Wendy! I absolutely love this blog writing and article which you have written, and your care and sensitivity toward Rachel Jeantel! I am so, so saddened at how some people stereotyped her, including those some other black people who intraracially stereotyped her and found her a disgrace and a bad example of black people! I grew up black middle class, and I am horrified at how some middle class black people were offended by Rachel and found her to be a disgrace! These criticisms of Rachel Jeantel made me very sad overall! I can relate to how some people including some other black people looked down on Rachel because she is dark-skinned and full-bodied! I am a dark-skinned black woman, and I have been heavy-set and full-bodied most of my life! I can relate to how some people in my past and at times in the present (not all of the time, though) perceive me and used to perceive me as a dark-skinned, heavy set and full-bodied black woman! I thank-you so, so much, Wendy for your great sensitivity and awareness toward Rachel Jeantel, and how you are so in general! Blessings so, so much to your for always, Wendy! Have a very nice, special, and a very blessed Monday! Thanks for reading and for your reflections on the post on Rachel Jeantel. It seems people get so mean-spirited on social media, and are ready to tear some one down over what they think of them because of their perceived class status. I’m sorry if you are the subject of others’ negativity because of your appearance, and as you say, for being dark-skinned. I truly appreciate your openness in sharing your experiences here. It’s great for me to hear, and for WJSS readers, too.